I have never read Miracleman before the current Marvel comics reprints. I will share my impressions here with you. Hello everyone, I am back from a bit of a long absence. Sorry about that. Lets get back to talking about storytelling in comic books. 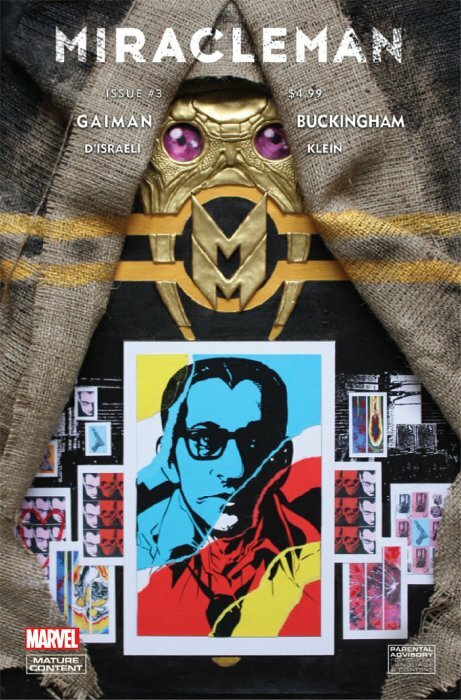 This issue of Miracleman’s Golden Age arc is told from the point of view of Andy Warhol. Yes you read that right. You may remember back at the end of Alan Moore’s run he mentioned that a Qys named Mors was making artificial duplicates of famous dead people in the basement of Olympus and he had made several copies of Andy Warhol. In this story Mors asks one of them to help him with a new person that Mors just brought back, none other than Emil Gargunza, Miracleman’s maker and nemesis. Gargunza has become part of the mythology of the Miracleman family but one they seem to have mixed feelings about. Andy Warhol becomes Gargunza’s friend and they have a lot of conversations about the world they live in. Most of the page layouts are homages to Andy Warhol’s work. Long story short, Gargunza builds himself a portable device so he can survive outside the basement and he never really liked hanging out with Andy Warhol so Mors has to shut him down. Then we get a creepy revelation. It turns out this was not Mors’ first attempt to bring Gargunza back to life. He has a whole closet full of failed Gargunza duplicates. At the end of each issue so far there has been a back up story called Retrieval. I have refrained from talking about it until I was sure it was going to add up to something. Miracleman sent a little robot ship into the infospace dimension where the Qys store their extra bodies. In this chapter it finally arrives at the Miracleman family’s original human bodies. The robot ship seems to take a sample from the remains of Young Miracleman, you know the other kid sidekick, the one that died before he could go insane or turn evil. I thought I saw something somewhere about Young Miracleman making a comeback during this run, looks like that will be soon. Also in the behind the scenes material there is a previously unpublished portrait of Neil Gaiman that artist Mark Buckingham did for Wired magazine in the 90’s. That was cool.